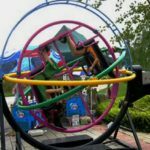 One of the more popular attractions, outside of the typical carnival rides that you will see at an amusement park, is called a gyroscope. 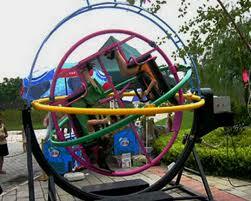 Also known as an aerotrim, it is a ride that is typically designed to fit a single human being. These can be used for a variety of purposes including a cardiovascular workout, developing balance that is necessary when flying a jet, and even astronauts use this to work on equilibrioception which is so necessary when you are in the weightlessness of space. However, they are also fun to ride if you can stomach, pun intended, the ride itself and you can sometimes find these for sale on the web. 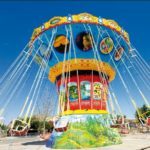 Originally invented back in Austria, dating back to the early 1900s, these rides used to require human strength and balance to direct the motions, but you can also purchase them fully automated, allowing you to accommodate between one and four people. 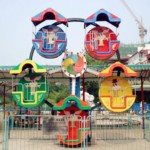 Whether you are standing in the middle of the concentric rings which will rotate, or you are seated, it still provides a very similar experience for those that will go spinning around in this very unique device. Where You Can Purchase One? As far as the original gyroscope, the last ones were actually made under the Aerotrim name back in the 1990s after going through a substantial amount of legal problems. Today, there are clone versions of the gyroscope, sold all over the world, with Gyrogym being one of the top sellers. Most people are not looking for a workout, however, but simply having access to a fun ride that they and their kids can be in. 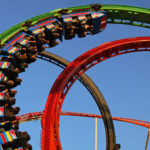 Sometimes amusement parks will pick up the larger versions that hold 2 to 6 people, and those are also readily available at many locations. Most of these do require some type of physical effort, even if you are seated. They are typically designed with each concentric ring of a different color, something that looks very beautiful from the outside as it is making the three dimensional rotation. 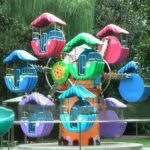 To find one that is for sale, you will want to look for an amusement park equipment website that has a multitude of carnival rides for sale. They will typically ask you to submit information so that you can get a free quote on the product. 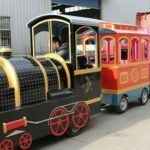 Gyroscopes tend to be much smaller than all other amusement park rides, and therefore the shipment and delivery costs will be comparatively minimal. Just make sure that the company you are working with is well-known in the industry, a fact you can verify on the web by checking the Better Business Bureau in the United States, or similar companies that are operating in different countries. 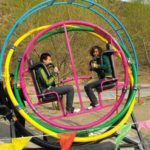 Once you are able to find a source for these rides, and also get multiple quotes on different gyroscopes, you will be able to pick one up either for your amusement park, or simply have one that you can use on your own. Whether this is for exercise, or just to say that you have one, these can definitely be found for sale every day. 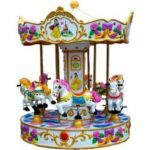 Just make sure you do your due diligence when choosing a company to purchase one from, making sure that the amusement park gyroscope that you get is of the highest quality possible.